Today I'm going to answer the question "Which is the northernmost bus stop served by a TfL bus?" I'm asking because the answer has just changed. Today it's this bus stop at Potters Bar station. But last Friday it was this bus stop on a nearby industrial estate. And yes, budget cutbacks are the reason why. Here's the story. 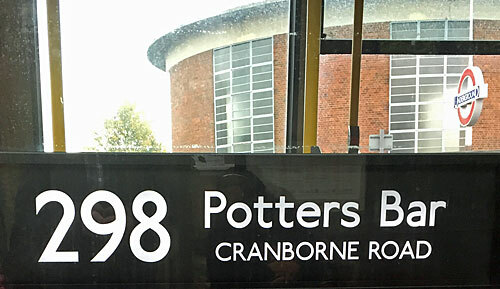 The bus route we're interested in is the 298 from Arnos Grove to Potters Bar. Evenings and weekends it ran from station to station, but before 8pm on weekdays it continued to the Cranborne Road Industrial Estate on the northwestern edge of town. It's this extension which TfL have just chopped off following a cut in funding from Hertfordshire County Council, so all buses will now terminate at the station. In last year's public consultation local residents complained about increasing isolation, unsafe walking routes, the disappearance of a step-free connection and having to pay more on other buses, but TfL replied by saying Hertfordshire isn't our problem, sorry, and you're lucky we don't turn buses round at the border. The route is still being run with the same number of vehicles "to improve reliability", but is now about a mile shorter, which must at least save on fuel. 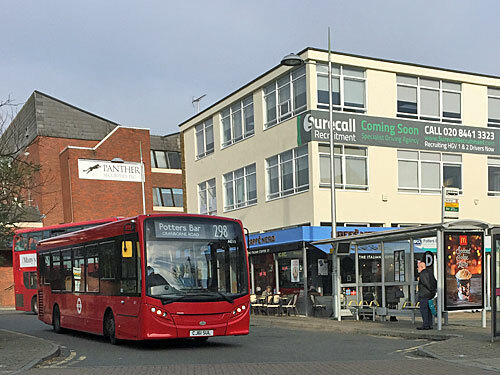 Route 298 runs every 20 minutes and is contracted to Sullivan Buses, an independent operator based at South Mimms. Here's a quick history of the route, as posted up inside the vehicles, because bus companies run by enthusiasts like to do this kind of thing. Last week I headed to Arnos Grove and took a ride to London's northernmost bus stop, back when it still was London's northernmost bus stop. From one architecturally-renowned underground station the driver led us to another at Southgate, then skipped on to a third at Cockfosters. From here the 298 goes it alone, past the gates of Trent Park and several quite large houses, before speeding through a mile of undulating open country. The border with Hertfordshire came just before junction 24 of the M25, and then it was into Potters Bar proper, via Potty Pancakes, Tesco and Mutton Lane. It had taken just over half an hour to reach the new, permanent end of the route at Potters Bar station. Only one other TfL bus gets this far - the 313 from Chingford - while other multicoloured services disperse to St Albans, Luton and Waltham Cross. The forecourt acts as a large turning circle, with four bus stops around the edge and a taxi stand in the centre. We pulled into a bus stop none of the posters said we would, where not quite everyone got off and a couple of people got on. 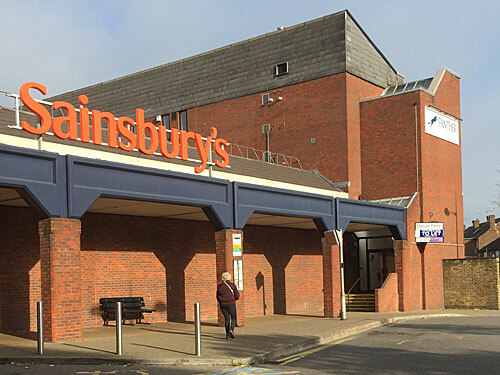 The presence of a big Sainsburys by the station had been the draw for one elderly passenger who'd be lugging her provisions home via the soon-to-be-doomed section. One mile to go, first back underneath the railway bridge, then back onto Mutton Lane heading west. Residents at these next couple of stops aren't going to be left bereft, they'll still have the frequent 84 which heads to Barnet, and the 398 which occasionally goes to Watford. But what they will now face is paying full market price for their journey, no longer cushioned by TfL's fares, which their council no longer subsidises. Last week they enjoyed a bus which heads into London for £1.50, this week it's £2.60... or they can jolly well walk to the station and catch the cheaper option from there. Only when the 298 turns off up Cranborne Road does redundancy truly kick in. There's only one more stop, half a mile distant, past a run of Thirties semis and dipping down into the valley of a minor brook before entering the industrial estate proper. What struck me first was the sheer number of cars ahead, both parked alongside the kerb but also on the forecourts outside various auto-related businesses. 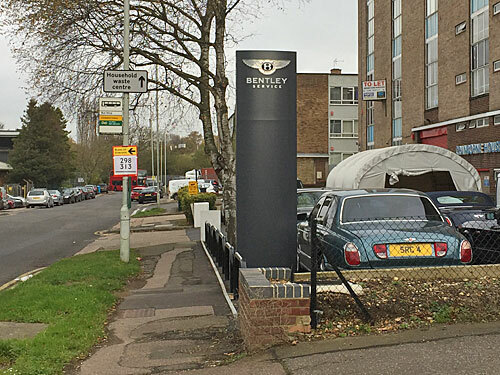 One multi-storey block is actually a Bentley service centre, its stock of scrubbed-up motors so exclusive that an employee was taking repeated selfies next to one of them. London's northernmost bus stop is bang outside. In fact there are two northermost bus stops, immediately opposite one another, and one is where the driver turfed me off. This particular stop had lost its flag - I found it later lying abandoned in the road beside a distant traffic island. Thankfully the bus stop on the opposite side of the road was intact. This being Hertfordshire there's no roundel or route number, but there is a message on the timetable panel warning that the 298 is being withdrawn. It's been stuck to the glass using sellotape, and looks like it's been churned off an office printer, then chopped up into strips. Something similar is stuck to all the other doomed bus stops, if not at such a jaunty angle. I reckon two sheets of A4 were probably sufficient. 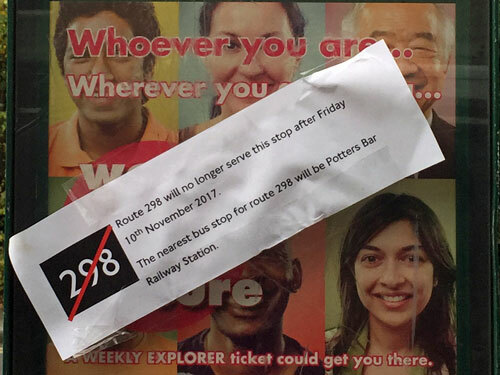 The Timetable Removal Team can never resist going round early when a route is due to change, so the current 298 timetable has already been removed. Posted up instead is Hertfordshire's replacement, an extension of route 242, which reveals a startling drop in service. From today the Cranborne Industrial Estate will only be served by a single bus arriving at half past seven in the morning, and another departing at just after five in the evening. If these two services don't fit your working day, bad luck, you'll have to walk in, or maybe throw in the towel and commute by car. TfL's consultation suggested around sixty commuters would be disadvantaged, but remember this is Hertfordshire's problem now, and money no longer grows on trees. Technically there is/was a bus stop slightly further north, namely the bus stand where the drivers on route 298 waited up between departures. It's only a short distance ahead, on a scrappy verge beneath the East Coast Mainline, where a forbidding passageway leads off along the foot of the embankment. Sullivan Buses appear to use the area as a bus park, ideal for storing schoolbuses between the peaks as well as 298s not currently out in service. Numerous light industrial units are swirled around the neighbouring loop of access roads, from flooring consultants to skip hire depots and specialist vinyl distributors to plumbers merchants. It's easy to question what a London bus was ever doing out here in the first place, let alone running 83 times a day, but some legacy networks take decades to decay. So that's why London's northernmost bus stop has changed, why it used to be on an industrial estate and is now outside Potters Bar station. 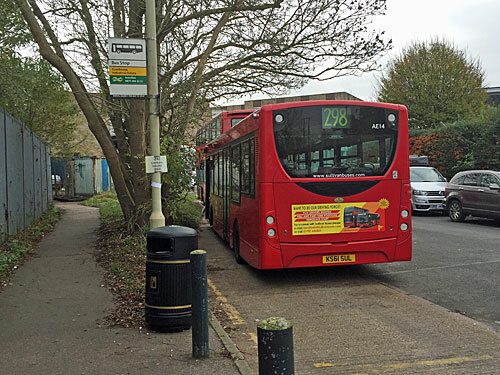 When a council outside the capital stops funding London buses it no longer has any say over how TfL chooses to cut them back, and Hertfordshire can probably count itself lucky that no other routes have been curtailed so far. The 292's excursion to the outposts of Borehamwood looks potentially vulnerable, and I'm sure TfL's accountants would rather the 142 and 258 didn't both venture up to Watford Junction. Sadiq's budget squeeze means a lot of TfL bus services are seeing frequency reductions these days, but it's London's links to its surrounding counties which are most at risk from fare freeze pruning. A pedant writes: It may not appear on any map, but there is one TfL bus service in Potters Bar which still runs fractionally further north. 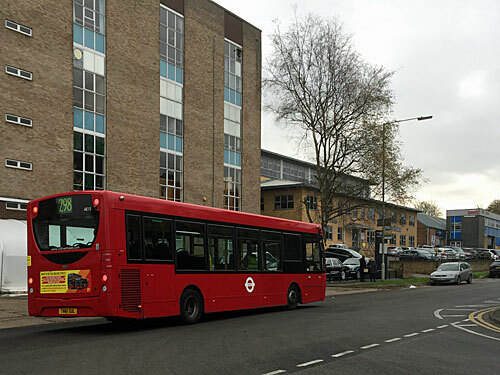 The 313 normally runs between Chingford and Potters Bar station, but during termtime one additional service continues to Dame Alice Owens School in the morning and another returns in the afternoon. If you count this one-off academybus, then the northernmost bus stop on the TfL network is now at the top of Dugdale Hill Lane, but I choose not to because you'd have to be the laziest schoolkid imaginable to alight so close to where you got on.